Serene is a simple, modern free WordPress theme built with design in mind. 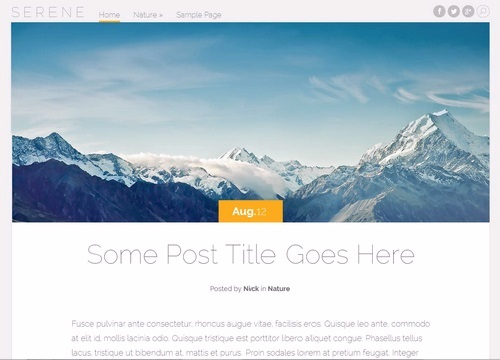 Serene, a responsive theme is a truly beautiful blogging theme with post format support. You can easily display a dynamic feed of articles, videos, audio files, quotes, galleries and links in the most elegant way possible. The design’s elegance stems from its simplistic and spacious design. Browsing the theme is easy on the eyes and on the mind.